TO ROME WITH LOVE is a kaleidoscopic comedy movie set in one of the world’s most enchanting cities. The film brings us into contact with a well-known American architect reliving his youth; an average middle-class Roman who suddenly finds himself Rome’s biggest celebrity; a young provincial couple drawn into separate romantic encounters; and an American opera director endeavoring to put a singing mortician on stage. Well-known architect John (Alec Baldwin) is vacationing in Rome, where he once lived in his youth. Walking in his former neighbourhood he encounters Jack (Jesse Eisenberg), a young man not unlike himself. As he watches Jack fall head-over-heels for Monica (Ellen Page), his girlfriend Sally’s (Greta Gerwig) dazzling and flirtatious friend, John relives one of the most romantically painful episodes of his own life. At the same moment, retired opera director Jerry (Woody Allen) flies to Rome with his wife Phyllis (Judy Davis), to meet their daughter Hayley’s (Alison Pill) Italian fiancée, Michelangelo (Flavio Parenti). Jerry is amazed to hear Michelangelo’s undertaker father, Giancarlo (renowned tenor Fabio Armiliato) singing arias worthy of La Scala while lathering up in the shower. Convinced that talent that prodigious cannot be kept hidden, Jerry clutches at the opportunity to promote Giancarlo and rejuvenate his own career. Leopoldo Pisanello (Roberto Benigni) on the other hand is an exceptionally boring guy, who wakes up one morning and finds himself one of the most famous men in Italy with many unanswered questions. Soon the paparazzi trail his every move and question his every motivation. As Leopoldo grows accustomed to the varied seductions of the limelight, he gradually realizes the cost of fame. Meanwhile, Antonio (Alessandro Tiberi) has arrived from the provinces in Rome hoping to impress his straight-laced relatives with his lovely new wife Milly (Alessandra Mastronardi) so that he can get an upscale big city job. Through comic misunderstanding and chance, the couple is separated for the day. Antonio ends up passing off a stranger (Penélope Cruz) as his wife, while Milly is romanced by legendary movie star Luca Salta (Antonio Albanese). 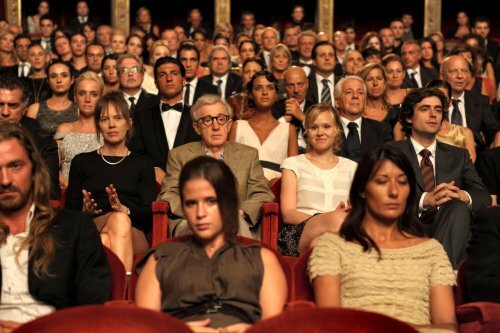 While Rome is a city abundant with romance and comedy, Woody Allen’s TO ROME WITH LOVE is about people having adventures that will change their lives forever.